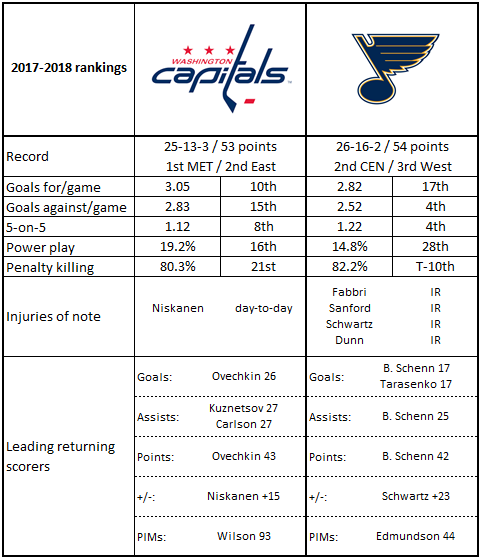 After a four-day gap in the schedule, the Washington Capitals return to the ice on Sunday afternoon to host the St. Louis Blues at Capital One Arena. The Caps will be looking to extend their overall winning streak to four games and their winning streak at home to nine games. The Blues will be wrapping up a two-game road trip having lost the front end of a back-to-back set of games in Philadelphia, 6-3, to the Flyers on Saturday afternoon. The loss stopped a three-game winning streak for the Blues, but for the Blues it was their fourth loss in their last five road contests. If there has been a surprise for the Blues in the first half of the season, it might be Brayden Schenn. The younger of the Schenn brothers (Luke is a defenseman for the Arizona Coyotes), who came to the Blues in trade last June for Jori Lehtera and two first round draft picks (one of them conditional), is tied for the team lead in goals (17, with Vladimir Tarasenko) and tops the team in points (42). He is on a pace to finish the season with 78 points, which would obliterate his career high of 59 points, set in 2015-2016 when he skated for the Philadelphia Flyers. His season has not been one of consistent scoring as much as it has been one with a hot streak dominating his numbers. In an eight game stretch in November, Schenn was 7-12-19, plus-11, posting five multi-point games, including four-point games to start and end the streak. In 22 games since that streak ended he is a more modest 7-5-12, plus-1. Schenn’s 17 goals have been consistent with winning this season, the Blues being 11-2-0 in the 13 games in which he found the back of the net. In 22 career games against the Caps, he is 4-5-9, minus-4. The player with whom Schenn is tied for the team lead in goals – Vladimir Tarasenko – has firmly established himself as one of the most prolific goal scorers in the NHL. In his four full NHL seasons, he is the third-leading goal scorer overall (154 of his career 162 goals), trailing only Alex Ovechkin (213) and Sidney Crosby (159). He is off his game a bit, though, on a pace to finish with 32 goals this season after finishing with 37, 40, and 39 the past three seasons. He has been in a dry stretch lately. Since he recorded a pair of goals in an 8-3 win over the Edmonton Oilers on November 11th, Tarasenko has five goals in 22 games. Like Schenn, his goals and Blues wins go hand in hand, the team going 11-3-0 in games in which he has a goal. Tarasenko is 5-1-6, plus-4, in seven career games against the Caps. With Jake Allen getting the call and taking the 6-3 loss in Philadelphia on Saturday, Carter Hutton could be the goalie of choice for the Blues on Sunday. Hutton has been cast as a backup goalie for most of his six-year career with three clubs (Chicago, Nashville, and the Blues), but he has been a fine performer whatever his role. He is having a career year this season with St. Louis with a record of 8-3-0, 1.65, .947, with one shutout, the goals against average and save percentage being the best of his career to date. In his last seven appearances he has a record of 4-1-0 (one no-decision), 1.34, .958 with one shutout. The odd feature of his record to date is that he has just one full game played on the road (and just 72 minutes in total) since October 27th, a 2-1 loss to the Flames in Calgary on December 20th. Hutton is 2-2-0, 3.66, .861 in five career appearances against the Caps. 1. St. Louis averages just 8:04 in penalty minutes per game, third fewest among Western Conference teams. 3. Only Washington has more wins this season (16) when leading after one period than the Blues (15). Their winning percentage (.938/15-0-1) is third behind the Caps (.941) and the New York Islanders (1.000). No team has more wins when leading after two periods than the Blues (20, tied with Dallas), and they are one of six teams unbeaten when leading after 40 minutes. 4. When St. Louis outshoots an opponent, they win. They have won more often than any team in the league (19 wins). Then again, they have outshot opponents 31 times in 44 games, more often than any team in the league. So there being only one team with more losses when outshooting the opponent (12, one fewer than Arizona) should not be a surprise. 5. St. Louis is second in the league in third period goals scored (53, two fewer than Los Angeles), and their plus-24 goal differential in the third period leads the league. 1. Only three teams have averaged more penalty minutes than the Caps this season (10:16) – Boston (10:41), Anaheim (10:49), and Nashville (13:28). 2. For what it’s worth, only three teams have taken fewer faceoffs than the Caps (2,435) – Carolina (2,416), the New York Rangers (2,415), and San Jose (2,339). 3. The Caps have been very efficient shooters so far this season (10.6 percent). Only Tampa Bay (`0.8) and the New York Islanders (10.6 percent) have been better in the East. 4. Only two teams have fewer losses when outshooting an opponent than the Caps (four) – Nashville (three) and New Jersey (two), but then again, the Caps have outshot opponents only 14 times. Only five teams have outshot opponents fewer times. 5. Washington has the third-best winning percentage in one goal decisions (.688/11-2-3), trailing only Vegas (.722/13-3-2) and Toronto (.765/13-2-2). In his eight full seasons in the NHL, Alex Pietrangelo has established himself as a top-flight offensive defenseman, even if he doesn’t get as much attention as fellow top-ten scorers like Erik Karlsson, P.K. Subban, Shea Weber, or Kris Letang (Pietrangelo ranks ninth in that group with 328 points in that span). He ranks 17th in all-time scoring for the Blues (331 points) and is third among defensemen, trailing only Chris Pronger (356 points) and Al MacInnis (452 points). He is on a pace this season to finish with a career best 55 points. Pietrangelo does not have a goal since November 9th, a span of 22 games, but he does have 12 assists in that span. He is a minutes-eater, ranking ninth in the league in average time on ice (25:32). However, the Blues are just 11-9-2 in the 21 games in which he topped his average. Pietrangelo is 1-2-3, minus-3, in 10 career games against Washington. Since the end of October, Lars Eller has four goals in 29 games. That’s not an especially big number, but all of them were recorded in a span of 17 home games. Eller’s is something of an odd record with the Caps this season. You might think players active in the offensive end, even if they aren’t scoring, might be associated with wins. However, the Caps are 12-3-2 in the 17 games in which Eller recorded one or no shots, 6-2-2 when he was blanked altogether in shots on goal. If there is a personal indicator that links Eller and wins, it is faceoffs. The Caps are 16-2-2 in 20 games in which he finished at 50 percent or better on draws, 9-10-1 in the 20 games in which he finished under 50 percent. Eller has yet to record a goal in six games against Central Division opponents this season, so this is an opportunity to fill his division scorecard. In ten career games against the Blues, the team that drafted him 13th overall in 2007, Eller is 1-3-4, plus-2. Getting four full days off in mid-season might be thought of as equal parts blessing and curse. It is a chance to recharge and recuperate from injuries (Matt Niskanen, who could return to the lineup for this game) before the long mid-winter push. On the other hand, four days off is four days of rust that accumulates, and practices do not do much to prevent that. The Caps, who have had a challenging history against this team (42-40-12-1 all time), have a three-game winning streak against the Blues, outscoring them 19-7. And goals have not been hard to come by in the Caps’ eight-game home winning streak, outscoring teams by a 34-17 margin. So, will rust hinder the Caps, or will they win a ninth home game in a row. Silly question.